Super Hero Boy: Shoes for your valentine! My little man, Connor, loves shoes more than almost anything else in the world. You could lay out a whole host of toys, clothes, and bobbles, and a lone pair of shoes in a pretty box and without fail he will scream shoes and most recently use the sign for shoes and rip into them first. His obsession with shoes goes way beyond his own shoes but mine as well he walks in my high heels better than I do, he may not be able to get his own shoes on his feet successfully but is pretty good at putting my shoes on my feet, and he can even tell the different in most cases between the right and left shoes. It seems ironic when his mother prefers flip flops to almost any other type of shoe and is almost as happy with a pair of flip flops from the dollar section at Target as she is with a pretty pair of shoes but his obsession is wearing off on me. I bought myself my first pair of really beautiful high heel strappy sandals two weeks ago and I felt pretty powerful when I wore them out to girls night though I will say dancing in high heels even for a short time frame is hard work!! I'd almost say that just wearing high heels is a workout all on it's own. So offering my son a pair of beautiful shoes for his Valentine's Day is only a natural gift. Actually for any child a pair of beautiful shoes is always a welcomed treat. I remember as a child, though usually I hated dresses and fancy shoes as I was a total tomboy, I had one specific sundress which I loved and a pretty pair of mary janes to match. I always felt special when I wore it and would usually pretend I was Dorothy from the Wizard of Oz. Investing in a great pair of shoes is also a great investment for parents as appropriate shoes can mean the difference in your child's lifetime of foot health as growing feet are the most needy when it comes to footwear. Pediped has always been a pioneer in children's footwear. 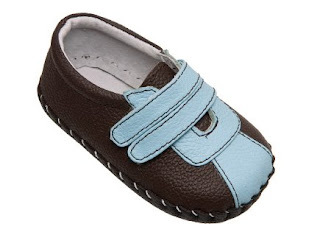 Pediped's original shoe line is very soft and though it looks and is styled like a traditional shoe it hides a completely soft flexible sole like you would find on the slipper type shoes that are very popular. 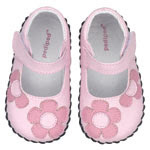 In young children and toddlers flexible soles are essential for proper foot growth. Pediped's shoes are very unique in the fact that their flexible soled shoes also offer a bit of padding for comfort and they really do look like a solid shoe but every aspect of the shoe is soft and flexible. Along with the original design the Pediped Flex offers a slightly more rigid sole with more arch support that is waterproof but still very flexible. The Flex offers one very unique design that sets it apart from other shoes in the fact that the flex is called the flex as it has its own flexible fit system. Each Pediped Flex shoe has insert able inserts that allow you to adjust the shoe just for your child's foot. Seeing as small feet grow fast and sometimes it seems that even as they outgrow one shoe they are too small for another the flex system really helps make up that gap. There are some beautiful Pediped shoes available in pink for little girls this Valentine's Day as well there are some hansom new styles for boys this year. Visit Pediped to see the full selection!